Will Brooklyn Nine-Nine be back for a fifth season? Recently, star Andy Samberg spoke with The Hollywood Reporter about the future of the FOX TV series. Season four of the comedy returns tonight, April 11th, at 8 p.m. ET/PT. The cast includes Andre Braugher, Terry Crews, Melissa Fumero, Joe Lo Truglio, Stephanie Beatriz, Chelsea Peretti, Dirk Blocker, and Joel McKinnon Miller. 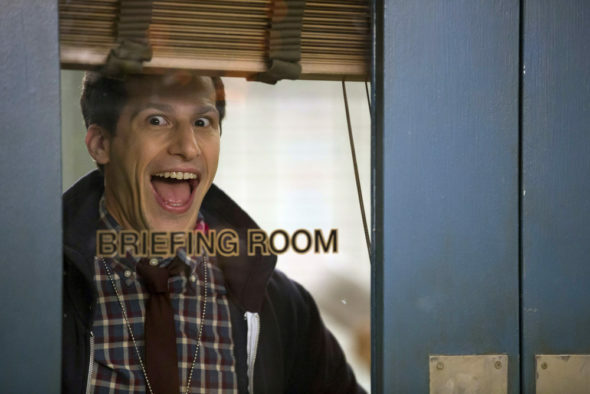 I feel like the way TV shows are measured has changed a lot in the last five, six years,” Samberg says. “There’s so much more expansion in terms of streaming and DVR and International. From the way that it’s explained to me, we are doing an actual really good overall number in terms of how many people on this Earth see our show each episode by the time it’s done running through all the different systems. Though the ratings have decreased over the years, the series has been a consistent player for FOX. Halfway through season four, Brooklyn Nine-Nine is averaging a 1.03 rating in the 18-49 demo and 2.453 million viewers. FOX has not yet announced a season five renewal for the TV show. What do you think? Do you watch Brooklyn Nine-Nine? Do you want a fifth season? Really enjoy 99. Hope it is,renewed. Please Keep on Brooklyn 99. Like chemistry of cast. I will be disappointed. Was sad when show was off for a few months. Get rid of Samberg .Keep the rest of the cast .Sorry people but i can not stand his infantile humor . Must be one of the perks of being a producer in the show . He is the show… im in holland tbe show has allready been on rerun on first couple seasons.